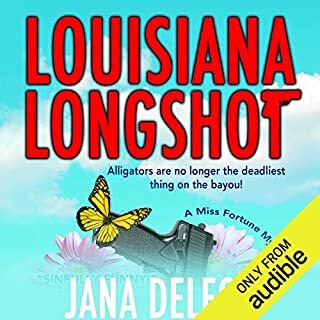 When Beauty Box beautician Tammy Smith is discovered with a pair of hair shears in her back, there are suspects and secrets aplenty in her small Southern town. Octogenarian Myrtle Clover, bored by bingo and bridge, is intrigued by the crime...and her neighbors' secrets. But discovering, and blabbing, secrets got Tammy killed and Myrtle soon learns her sleuthing isn't just dangerous...it's deadly. Finding herself in over her head with a case involving a politician's infidelities, Memphis-born karate expert Detective Sergeant Savannah Reid is told that she must turn in her badge because she is overweight. The first supper club is a progressive dinner... where Myrtle loses interest during the hors d'oeuvres. But when a body is discovered during the main course, the evening quickly gets interesting. 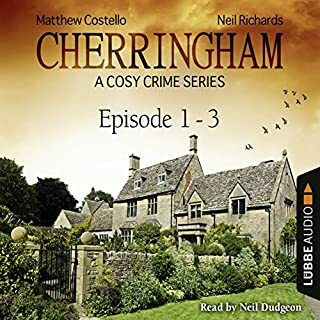 Myrtle pits her sleuthing skills against her police chief son's to find the killer.... if the killer doesn't find her first. What a delightful listen! Ms. Myrtle, retired eighty-something English teacher, with a yard full of garden gnomes . . . and a son named, Red, who happens to be the police chief of the small southern town . . . Well, she's trying her BEST to direct her wayward book club toward some classics, such as Dickens or Mark Twain . . . when WHAT should those totally uncultured, imbeciles come up with??? Well, a progressive dinner! That's what! Ridiculous . . . but it's a small town and Ms. Myrtle is voted down . . . so she goes along, even though she's a TERRIBLE cook . . . Great southern charm . . . a town full of busy bodies, in everyone's business . . . but with plenty of secrets . . . and a skillet full of surprises! 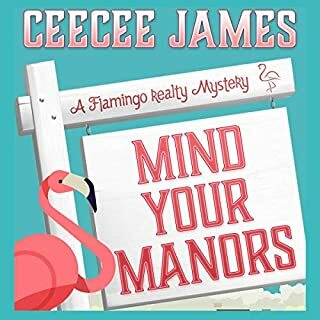 Laugh out loud cozy mystery!! Eighty something, Myrtle Clover and her neighbor, Miles are back at it again. While scheming to upgrade the books in their book group to some serious classics, Myrtle's busy body neighbor jumps in and convinces the group to change to a progressive dinner club. First of all, Myrtle is a terrible cook, but she purchases deserts for her turn. But her turn never comes around. The main dish hostess is found murdered on her kitchen floor. Someone based her head in with a frying pan. Myrtle is, apparently, only one of a couple people who actually didn't have a grudge against the victim. Once again, Myrtle competes with her police chief son, Red, to discover the murderer first. After all, she's added investigative reporter to her old age resume. Red tried to side track her into writing a "household hints" column, but shoot, with all the gossip around her small town, she just can't stop herself from listening --can she? Her new ferrel feline buddy is trying to help Myrtle too. He's teaching her how to "hunt" by bring different "catches" to her home, a sparrow and a chipmunk amongst other icky "food treasures". This continues to be a fun series filled with many interesting characters. Myrtle's habit of filling her front and back yard with garden gnomes to annoy her son, is just one of the creative actions of our octogenarian heroine that causes me to break out in laughter throughout this book. Definitely a fun cozy with a great mystery plot. 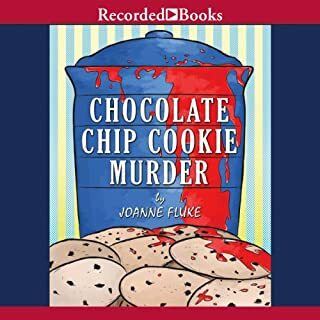 On of my favorite mystery series. I loved the voice used for Myrtle! Can't wait to download the next book. Funny!!!!!! This is the funniest book I've read in a long time! 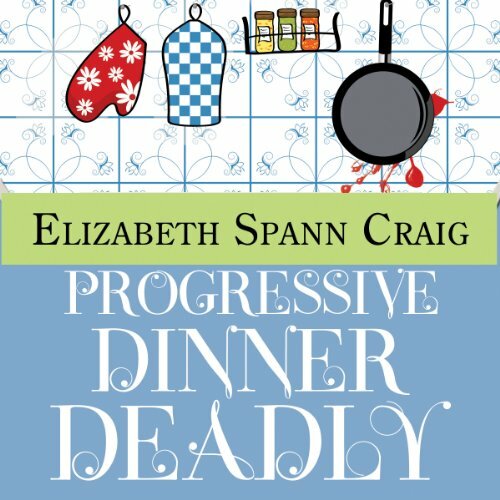 Would you listen to Progressive Dinner Deadly again? Why? Have you listened to any of Lia Frederick’s other performances before? How does this one compare? There were many times I laughed out loud. I love Myrtle, she reminds me of some fiesta seniors in my church. Although this book is listed in Audible as Book #3 in the Myrtle Clover Mystery, Amazon shows it is Book #2. Either way, it is my 1st taste of the cute cozy series with the 80-something retired school teacher/amateur sleuth. When Myrtle tries to elevate her book club to a higher quality reading experience, her ploy takes a wrong turn as the group decides to turn their meetings into progressive dinner parties. After one of their members is found dead with a skillet-smashed skull, the search is on for the killer. Throughout the story, Myrtle seems to always be in the right place at the right time while her son-the-police-officer is one step behind. Needless to say, the dinner parties are suspended, but this doesn't stop more bodies from showing up. 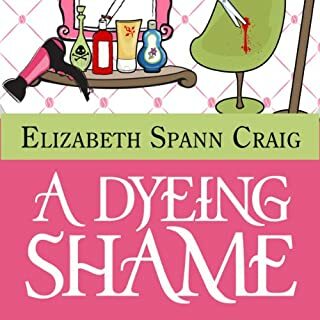 This delightfully humorous cozy by Elizabeth Spann Craig has an equally delightful narration performed by Lia Frederick. I look forward to enjoying more of the series. I listened to this book first because it is listed as the second book in the series on the author's web page. The characters are all well developed and engaging. The plot moves at a quick pace. I really enjoyed this book and will get the next one. Completely enjoyed the performance. Lia brings Myrtle alive and makes you believe that her neighbor, Erma, is as annoying as Myrtle describes. I really like these stories and hope that Audible will bring the entire series into their library. 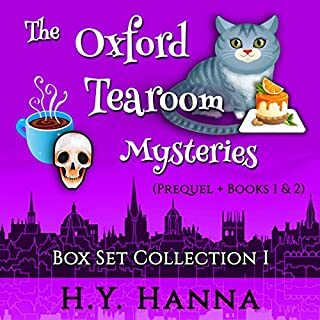 If you like listening to a lot of gossipy small town women then you'll like these mysteries. This one was a little better than the first one because of the antics of Ms. Clover's feral cat who had taken a shine to her and would bring her first presents and then other creatures to try to teach Ms. Clover on how to hunt. Like the first one Ms. Clover goes around gathering gossip so she can figure out who the murderer is, trying to beat her son, the police chief, to the punch. You never hear exactly how she figured it out until she's explaining it to the police. It's an easy listen and the narrator does a pretty good job. Nothing. I probably should have realized from the publisher's summary that it would be boring. Just not for me. I couldn't relate to any of the characters.